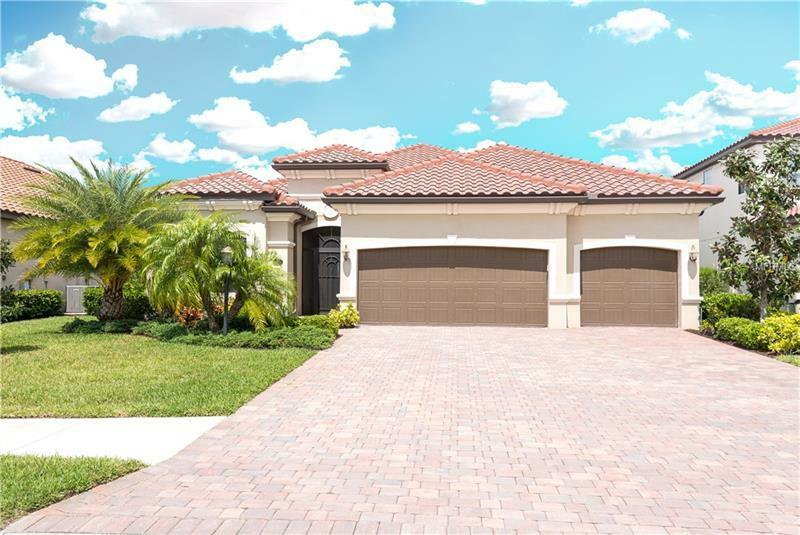 Exceptionally priced and in pristine condition, this 4 bedroom/2 bath/3 car garage pool home in beautiful gated and maintenance-free Bridgewater of Lakewood Ranch exudes curb appeal with its paver brick driveway, handsome tile roof and tropical foliage. Outside lighting was added and the enhanced landscaping is nicely maintained by community grounds maintenance. A screened entry porch leads into the open interior living area with fine details: high tray ceilings, crown molding, large ceramic tile floors, and neutral colors. Perfect for entertaining, the open plan features a dream kitchen with wood cabinets, stainless appliances, gas range, breakfast bar and pantry. A sunny breakfast nook is great for dining, in addition to the formal dining room, and both enjoy outdoor views. The indoor/outdoor feel is captured also in the large living room which opens through triple sliding doors to the paver brick lanai and caged area with sparkling pool and spa - all overlooking greenery and lush preserve. As a split floor plan, the master suite is a tranquil haven with a walk-in closet and bathroom with double sinks, soaking tub, glass shower and water closet, while a 2 bedroom suite is separate and shares a bath. The 4th bedroom is ideal for guests or as an in-home office or den. Bridgewater offers walking paths, lakeside pavilion, and playground, and is close to golf, fitness, YMCA, UTC mall, A-rated schools, medical facilities, shopping, dining, Earth Fare, and is a short drive to award-winning area beaches.